I didn’t love how they turned out. To be fair, I got overly creative the first time and made some changes to the recipe and I think that’s why I wasn’t completely thrilled with the results. My big mistake that time was that I decided to mix some chocolate chips into the bars. I wasn’t doing my best thinking though, because I tossed the chips in with the mixture before I poured the boiling hot honey mixture over the top. For some reason I thought they would remain whole, but of course they melted. (Duh.) This made an already sweet recipe very, very sweet. I have a serious sweet tooth, so when I say that something is overyly sweet, you can be assured that it’s not for the faint of heart. I still think I might try adding chocolate chips to the recipe in the future, but if I do I’ll press them into the top of the bars after I’ve put them into the baking pan and let them cool down a bit. In any case, they were still good enough to eat, but I felt there was room for improvement. 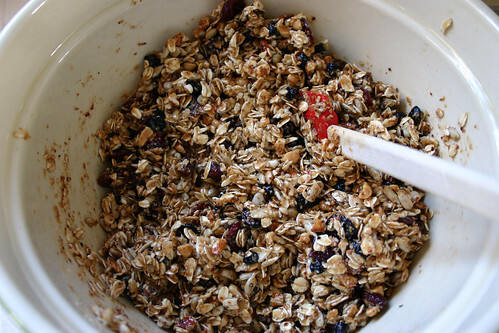 This batch came out much better than the first and I credit that to following the recipe more closely. There were no melted chocolate chips this time and for the nuts I used about 1/3 cup peanuts and 2/3 cup almonds. This was a nice combo because you still get some of the crunch from the peanuts, but the almond flavor is a little nicer (in my opinion). One other variation I made is that instead of using all vanilla extract I used half vanilla and half almond extract, another flavor I’m particularly fond of. 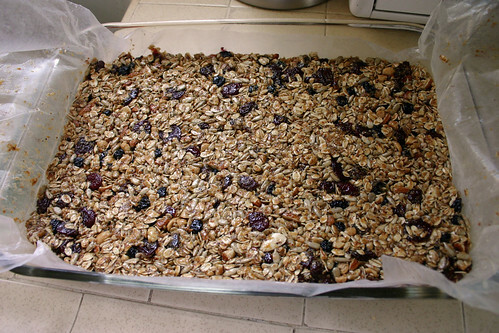 For the dried fruit, I used Trader Joe’s dried cherries, blueberries and strawberries mixture. Num! Num! 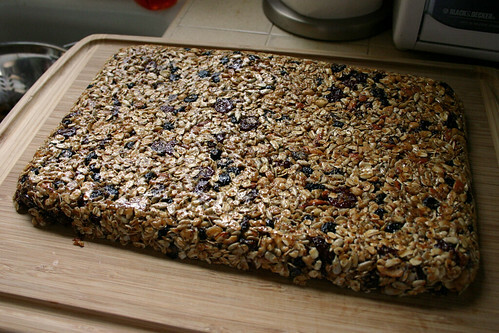 Here’s the granola cut into bars. I cut them into different sizes because sometimes I only want a little and sometimes I want a lot. 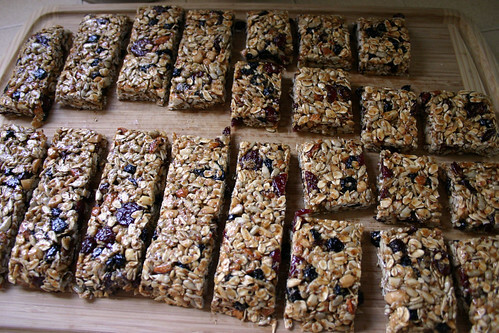 The granola bars are chewy, but the nuts give them a nice bit of crunch. They seem to keep for a pretty long time (several weeks) if you wrap them up in plastic, but they are definitely best the first week. They get a bit more chewy than I prefer as time goes on. Another thing to note is that my three-year-old son doesn’t really like them and when my cousin made them her three-year-old daughter, she didn’t like them either. So if you’re thinking of making these for a preschooler, do with that information what you will. Adults all seem to like them though. If you decide to try these and you like them, you should head on over to Joyful Abode and leave a nice comment for the blogger. Which is just what I’m about to do….